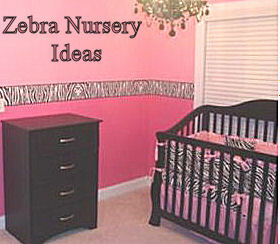 I'm excited to show you the latest pink zebra baby nursery ideas for spring. Mother Nature has been slow to reveal her traditional display where I live and her reluctance to wake up and put the season's beauty on display has inspired me to search elsewhere for bright colors to break the cycle of cabin fever. Baby girl's rooms traditionally feature their fair share of pink regardless of the season. Please note how there are no large areas of zebra print. After painting many accent walls in the past; I took an understated approach with this project. I know how to paint zebra stripes on the nursery wall but I chose to make the animal print subtle in this feminine, pink nursery room. The crib skirt drapes over the whimsical zebra rug and contrasts nicely with the black and white zebra pattern of the fitted sheet. 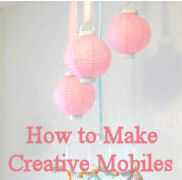 Paper lantern mobiles have been all the rage in nurseries for several seasons but in this baby girl nursery I decided that a mobile made of large, pink paper umbrellas hung from the ceiling in the corner of the room would suit better. As the rhyme goes; April showers bring May flowers and a girl wouldn't want to be caught without her parasol. I hope that you have enjoyed my baby nursery ideas for spring; happy decorating everybody! Has anyone seen zebra striped fabric in pink and white only? The pink, black and white combination is cool but I would prefer to use two colors only for my daughter's room.